Exchanges haven’t had the best start to 2019. Sure, Binance has been doing A-OK with its initial exchange offering (IEO) model, with its resident token rallying past $17, but lesser-known crypto platforms have been suffering. Earlier this year, QuadrigaCX was revealed to have ‘lost’ access to over $150 million worth of Bitcoin, Ethereum, and other assets, as Cryptopia suffered a devastating hack. 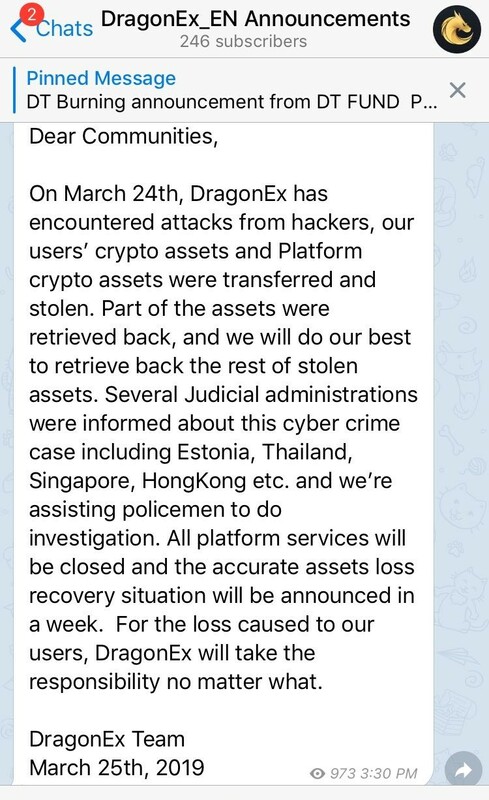 DragonEx has yet to divulge the exact details of the crypto assets stolen, including the type and the nominal value. However, the company did post the addresses of the assumed hackers, of which there were about 20 pertaining to a series of assets (Bitcoin, XEM, EOS, XRP, ETC, etc.). From a brief look, a minimum of 135 BTC, 500 Ether, and 4,670 LTC were forcibly yanked from the exchange’s coffers. This, for those who are wondering, racks up to ~$800,000. The full amount hacked, however, could easily be much higher than this sum. “We’re assisting policemen to do investigation. All platform services will be closed and the accurate assets loss recovery situation will be announced in a week. While this is a normal announcement for exchanges across the board, Coinbene’s session came straight out of left field, leading to ramping speculation. Nick Schteringard posted the below message in a bid to draw suspicion to the exchange’s Ethereum wallets, which sent out a mass of ERC-20 tokens yesterday. “suspicious exchanges” such as the little-known CoinBene to back its report. CoinBene purportedly utilizes “trade printing” between the bid and ask prices, hinting that there could be an automated system behind much of the trades. Thus, some have concluded that this sudden period of maintenance could be the platform’s bid to rectify bots and other bad actors. The post Crypto Exchanges Under Fire: DragonEx Hacked, Coinbene Undergoes Sudden Maintenance appeared first on Ethereum World News.